Konnekt makes it incredibly easy for the elderly to use Skype to see and talk to their loved ones, friends and care providers. The Konnekt video phone talks to anyone worldwide via Skype but has the world’s easiest user interface. It won Best Consumer Product in Aged Care. Most Konnekt users are seniors between 80 and 98, or would have difficulty using a mobile phone, tablet or computer. Videophone also calls regular telephones but is vastly easier to use than even the simplest telephone. 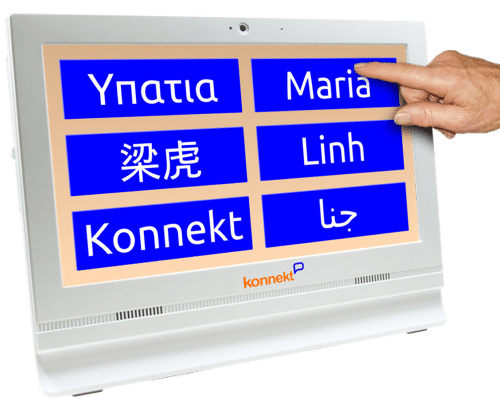 Can Konnekt Videophone really be simple enough for my 98-year-old who has memory loss and forgets to wear glasses and hearing aid? Konnekt Videophone comes with unbelievable service: Personalization. Setup and management of the Skype account. Contact invitations. Delivery. Best of all, I.T. Support: When Gran’s Internet or your device has a problem, we’ve got your back. Need more buttons? Increase volume? Konnekt does it for you. Remotely. Konnekt even helps relatives and friends get onto Skype, and tests with them. Imagine: Your whole family happily using Skype on their mobile and home gadgets, and you don’t have to convince them or show them how! Video calling is shown to increase cognitive ability in the elderly in just 6 weeks. Dementia is a horrible, slow death. Face-to-face contact with family and friends, less than 3 times a week, doubles depression risk. How often do you visit? Reducing social isolation and loneliness is also linked to better sleep, lower blood pressure, healthy habits, lower morbidity. Even performance in daily activities, like walking. See the studies. Is there a better present for your elderly parent than seeing family, staying healthier, being happier? Finally, seniors can use Skype easily, with zero computer skills. No support calls (“my tablet has a pop-up / went flat”). Just smiles. UNPACK. Plug in to power. That’s all. Really! LARGE screen, much bigger than fiddly tablets. LOUD. Many elderly dislike their hearing aid. HUGE one-press buttons. Glasses not required. HIDDEN. Everything else. Super easy! AUTOMATIC answering of trusted contacts. UNLIMITED calls. To phones, too. No surprises. CHANGES. We do them for you. Remotely. We have to. Australia is a long swim. With a Konnekt, Skype for elderly users is super simple. What are you waiting for? They’re not getting any younger. Note that Konnekt does not represent Skype or Microsoft.